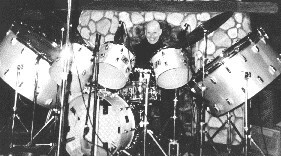 Drummer Edward Claude "Cass" "Mr. Skin" Cassidy started his musical career as early as in the 1930s. He served in the US Navy during the second world war, later played in Dixieland, Latin, big band and c&w orchestras, on film soundtracks, even a production at the San Francisco Opera for a short while before he dedicated his rhythm abilities to jazz. In 1964 he started the blues-folk group Rising Sons with Ry Cooder and Taj Mahal, but left soon after because he had injured his hand. The following year saw the formation of The Red Roosters with his 14 year old stepson, guitarist Randy Craig Wolfe (later changed to Randy California by Jimi Hendrix with whom he played with in 1966 before Jimi moved to England). The Roosters augmented by a keyboard player returned as Spirit in 1967. Cass was easily recognisable at the time because of his shaved head (hence his second nickname) and black clothes when quite the opposite was the order of the day among young musicians in California. Let's play some of Spirit's greatest moments one more time, not only the best of them all Twelve Dreams Of Dr. Sardonicus, but also the three preceding albums, in memory of Cass, Randy California, John Locke, Jay Ferguson and Mark Andes. By now only the latter two still walk this earth.